(a) TEM image of CdSe/CdS nanoplatelets. (b) Simulated excitation pattern of an emitter dipole shows uniform absorption. We show how polarized single photon emission from semiconductor nanoplatelets can be achieved despite their 2D isotropic emission dipoles. 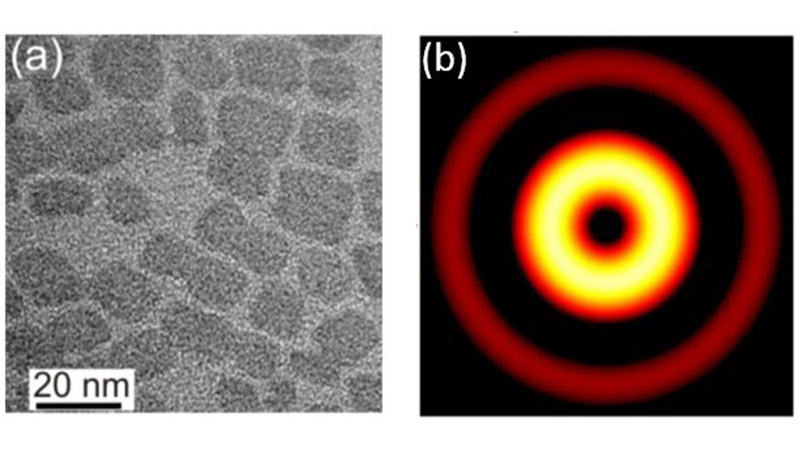 This work will further enable quantum optics and quantum network opportunities utilizing nanoscale single photon emitters by manipulating their emission polarization and directionality. Absorption and emission dipoles of core/shell CdSe/CdS semiconductor nanoplatelets were studied using single particle spectroscopy at the Center for Nanoscale Materials (CNM). The study employed the quantum entanglement microscope and dry etching capabilities at the CNM. (a) Geometry-dependent polarization anisotropy. (b) Electric field distributions show the likelihood of optical transitions for light polarized along the short axis (left) is lower than along the long axis (right).